JNN 28 Oct 2014 Sanaa : Fighters from the Shia Houthi Ansarullah movement have reportedly managed to take control of a strategically-important crossing along Yemen’s northern border with Saudi Arabia. The Houthis captured Tawwal border crossing in Hajjah Province on Saturday. They also took control of Wagha region in the same province. Tawwal border crossing witnesses massive traffic between Yemen and Saudi Arabia. Ansarullah fighters already control the cities of Sana’a, Ibb, Dhamar and the major port city of Hudayda. Also on Friday, Houthi fighters took control of the strategic town of Rada’ in the province of al-Bayda. Al-Qaeda-linked militants were controlling the town for nearly two years. The development comes amid separate reports of ongoing clashes in the province of Ibb despite a deal between the Houthis and al-Qaeda-linked militants to end violence in the region. 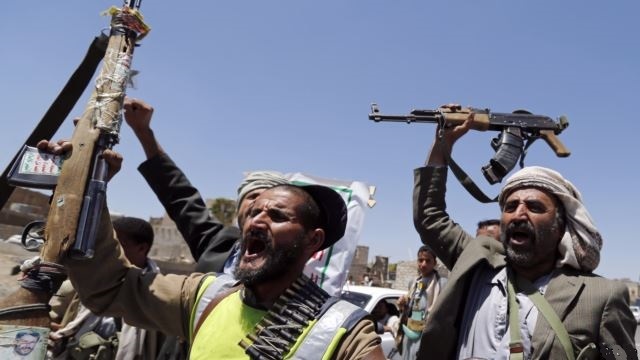 In September, Ansarullah revolutionary fighters gained control over the capital, following a four-day battle with army forces loyal to General Ali Mohsen al-Ahmar, the half-brother of former dictator, Ali Abdullah Saleh. The Ansarullah movement played a major role in the popular uprising that forced Saleh to step down after more than 33 years in power. Yemen has been facing threats from al-Qaeda-linked militants, as well as a separatist movement in the country’s southern region. This entry was posted in Middle East and tagged Ali Abdullah Saleh, Ansarallah, Ansarullah, Saudi Arabia, Shia Houthi, Shia Houthi Ansarullah, Yemen. Bookmark the permalink.